This cake is sweet perfection! 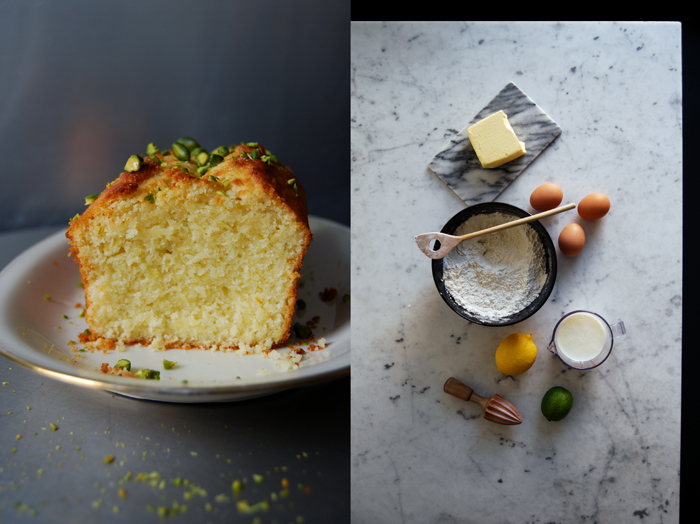 It’s spongy, juicy, buttery and lemony with a touch of flowery lime which gives it a soft hint of marzipan. It’s simply a scrumptious loaf cake and I could have just left it at that, cut into thick slices with a cup of tea and I would have been more than happy. 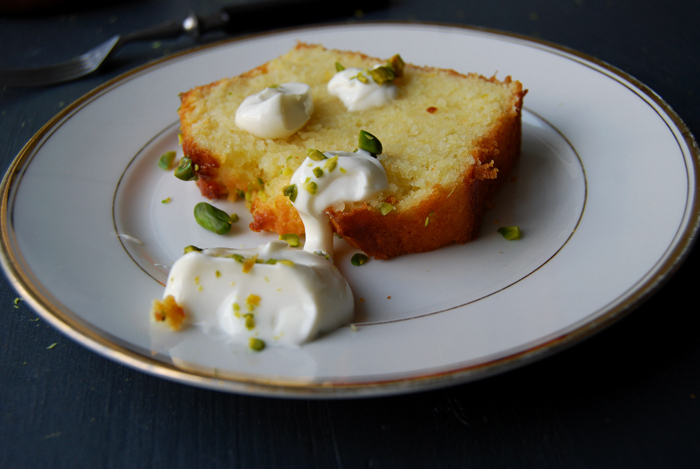 But I asked for more, no puristic cake treat but a rich composition of cakey citrus flavours topped with Greek yoghurt whipped with orange blossom water, Maltese honey and sprinkles of unsalted pistachios. This is a proper dessert, also very convenient as a special Sunday tea time treat, but definitely beyond a simple breakfast cake. 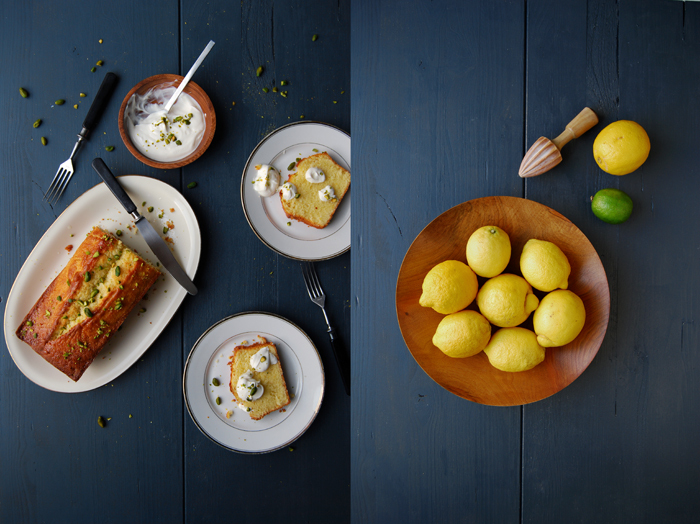 My cake tastes like a summery day in the Mediterranean, the sun at its zenith, so hot that it invites all the beautiful fragrances around you to merge into an enchanting perfume of citrus, salt and warming sweetness. Imagine the smell of your last holiday in a hot and dry country, close your eyes and feel the sun on your skin, all those rich and exotic aromas surrounding you and caressing your senses. That’s how this sweet little wonder made me feel and that’s why I call it perfection! More about the dough which led to this satisfying experience: I mixed some cornstarch into the flour, a trick I already used for my apple breakfast cake, it guarantees a very light and fluffy result. 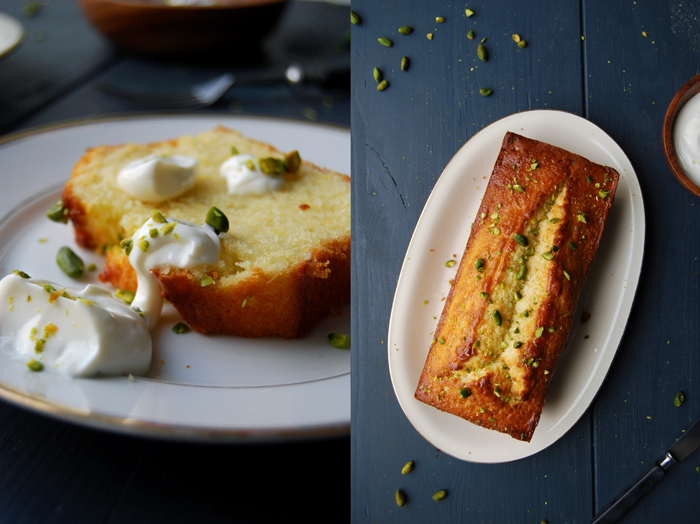 Then there’s also buttermilk which adds the right juiciness to keep your fingers moist when you hold a slice of this cake in your hands. You could also reach this pleasant effect with more butter but that would make it heavier. Vegetable oil would also be an efficient alternative to end up with a very juicy cake (it’s actually used quite often in combination with buttermilk) but the taste tends to bug me when there are such fine aromas involved. I like it for my nutty Florida carrot cake, but I usually prefer to work with the dairy product. In the end, everything was just right in this cake, well balanced and harmonic. When that happens I don’t ask any more questions, I’m just a thankful baker. Set the oven to 160°C / 320°F (fan-assisted oven) and butter the loaf pan. 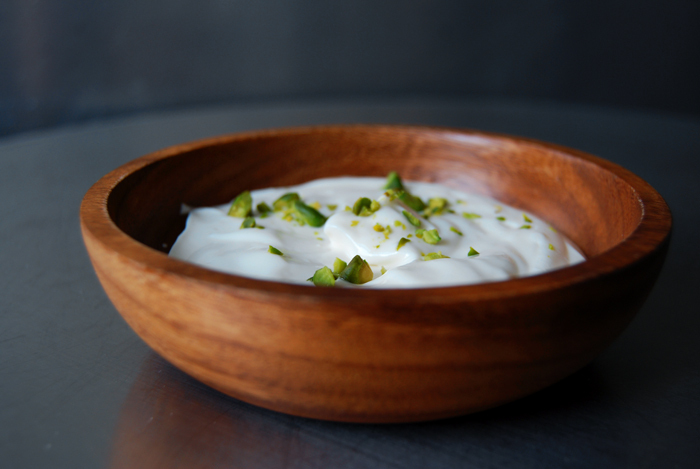 In a large bowl, whisk the butter with an electric mixer until fluffy, add the sugar and continue mixing until well combined. Add the eggs, one at a time, mix well in between. When the mixture is light and creamy mix in the zest and juice. Gently stir in the flour/ cornstarch mixture with a wooden spoon, in batches, alternating with the buttermilk (about 1/3 of each at a time). Pour the dough into the buttered pan and bake for about 50 minutes or until golden on top. Check with a skewer, it should come out clean. Let the cake cool in the pan for a few minutes before you put it on a wire rack. For the syrup, whisk the icing sugar and lemon juice until combined. 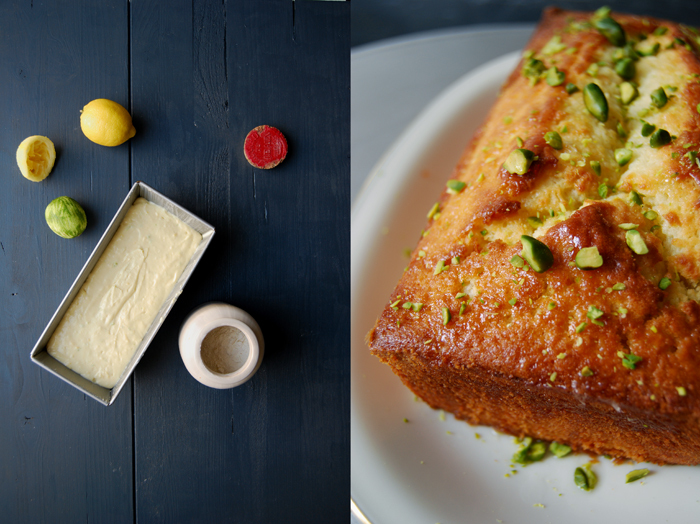 Prick the cake and slowly pour the lemon syrup over the top of the cake, sprinkle with chopped pistachios. 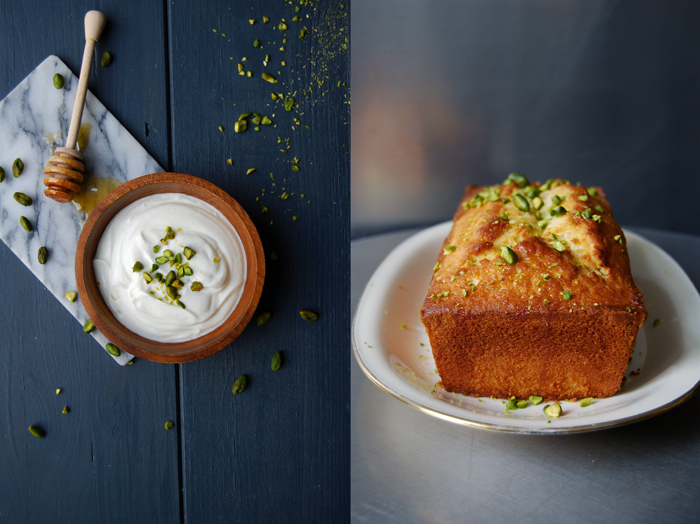 Whisk the yoghurt, orange blossom water and honey, season to taste and serve with the warm cake.